This 9 x 12 Light Cherry Award Plaque is 3/4 in. thick, has a stepped edge and square corners. It can be matched with 3 laser etched plate styles and 4 plate colors: maroon, blue, green and black for a fully customized award plaque. 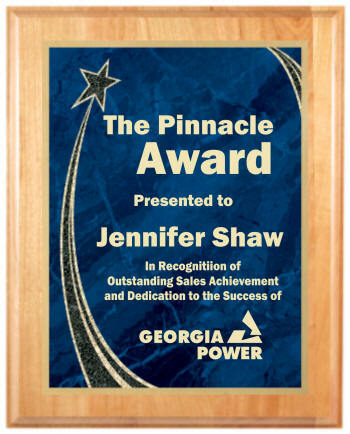 You can upload or email a logo, graphic or complete layout to incorporate into your award plaque. We will provide a proof of the layout prior to completing your order. This light cherry award plaque has a keyhole in the back for hanging and our award plaque orders usually ship in 48 hours.